Jazz reviews and comment from one man with an unfeasibly large record collection. I have to admit that this album was rather unfairly overlooked by me for a long time. I bought this and it's companion “Rockin' The Boat” (recorded at the same sessions) on CD as part of the Blue Note 'RVG Edition' series of reissues. I'd come fresh from getting excited by Smith's Verve-era big band compositions, and was expecting more fireworks here. For some reason i initially found the albums underwhelming, then i discovered that they were recorded right at the end of Jimmy's soujourn with Blue Note. Contract filler, thought I, and after a couple of listens filed them away on the shelf, where they languished, unloved, until earlier this week. It all started with a Blue Note compilation – 'So Blue, So Funky – Heroes of the Hammond vol. 2' which i was listening to the other day. It has the track 'Can Heat' from “Rockin' the Boat”, and after listening to it a half-dozen times and being impressed by it's loose, laid back funkiness, i thought “wow, this is great, i wonder what LP it's from”. Imagine my surprise when the very album was sat there on my shelf. Well, needless to say i've not listened to an awful lot else this week. 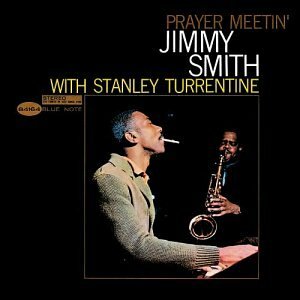 The music is typical Blue Note era Jimmy, but with a less serious tone than on albums such as “The Sermon”, and a better realised organ sound than on some of his earlier works. In keeping with the end-of-contract timing of these albums, there is a jam session feel to the recordings – the players were in there to have a bit of fun and make a few dollars, and that sense of fun really shines through. Both albums feature a tenor – Turrentine here and Lou Donaldson on “Rockin'...”, the presence of which adds vital colour to the date. It's also worth mentioning the quality of the production – which i'm sure is at least in part owing to the recent remaster. The audio quality of all of the RVG editions i've had the pleasure of hearing is uniformly excellent. This particular CD issue also brings in a couple of tracks from a 1960's session – also featuring Turrentine ('Lonesome Road' and 'Smith Walk') which share a similar feel of relaxed funkiness to the main LP. The audio is a bit less good though, and Smith still has some of that seaside Wurlitzer sound that makes some of his early LP's so unappealing. hey man, I like your blog. Especially the radio. Can you help me to creat a similar radio on my blog. Can you give me your code? Please send me through my email. Thanks a lot. Stay jazzy!!! Merry Xmas from The Daily Jazz!